First, you'll set up your test. This is where you'll specify the administrative details—availability, time limit, and proctoring, to name a few. These items are covered below. Next step will be to design your test: adding headings, instructional text blocks, and, of course, questions. Your students will take the test, after which time it's time to handle grading. Some grading can be done automatically, and some has to be done by you. When all's said and done, test grades are automatically entered in the gradebook. You can accomplish steps 1 & 2 by cloning or syncing tests from other courses. To create a new test, you must create the corresponding assignment. 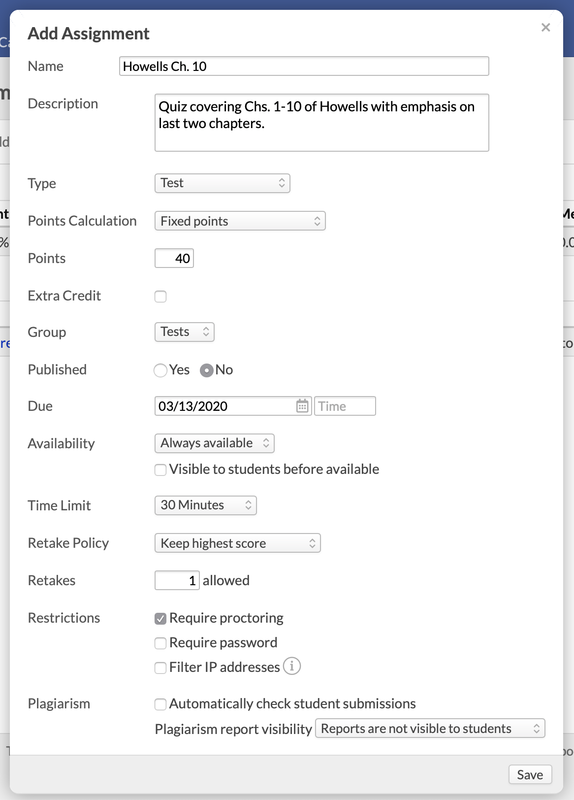 Go to your course and click the Assignments view. Enter the name, description, and other assignment details. For the assignment type, choose Test. New fields will open up when you do this. Due date is the date by which students must take the test. If you wish, you can change the availability (see below) to permit students to take a test past the due date. Availability is the timeframe during which students may take the test. Enter dates and times in the appropriate fields. Read about the four different availability options here. Availability trumps the time limit! If a student begins a test with no time limit ten minutes before the availability ends, that student has only ten minutes to take the test. When students take the test, they can see how much time they have remaining. If they time out, unanswered questions will be marked incorrect. If students are logged out in the middle of taking the test, they can resume where they left off with any unused time remaining (unless the availability window closes). If need be, you can add an availability exception on a by-student basis. Retakes give your students multiple chances to take the test. The three options—highest score, most recent score, and average score—refer to which test score will be used as the grade. The number of retakes is not the same as the number of times students can take the test. If you want to let your students take the test a total of 3 times, enter 2 in the retakes field. Check Proctoring to require that every student take the test with a proctor. Now that you've created the test, it appears in the assignment list and in the list under the Tests view. In the Tests view, you'll find a list of all of the tests contained in this course. Click the test name to go to its page, where you can adjust its settings and start designing it. Unassigned points indicates that, while the test has questions, not all of the test's points have been distributed among those questions. In either case, students will not be able to take the test until you finish designing it! Changing the test's default feedback settings. Requiring proctoring for the test. Adding exceptions for the test's availability, time limit, retake, and proctoring settings to accommodate special needs for specific students. After setting up your test, it's time to start designing it. I follow the instructions, set up my test, but when I go to the 'tests' page, its not there. Which user role(s) can create/edit tests? Is it possible that I can enter the standard answer as "case-sensitive grading" after students submit all their answers? Is there a way to equally distribute credit between each question within the test? When does the count down start for the time limit? When the student clicks into the test or when they starts answering the first question? How can I import a test from a textbook publisher testbank?